Paramount Pictures has released their Super Bowl trailer for The Spongebob Movie: Sponge Out of Water, which debuted during NBC's coverage of Super Bowl XLIX today. The trailer comes on the heels of 30 new photos and a music video by Pharrell Williams and N.E.R.D. that debuted last week. 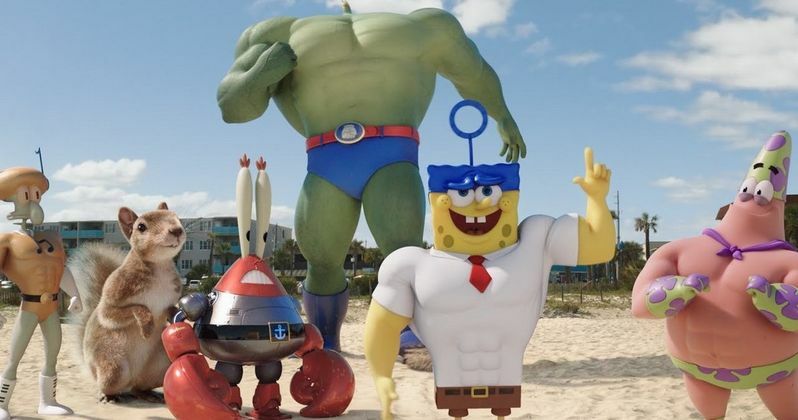 As you can see in the latest footage, Spongebob and his Bikini Bottom buddies get "super-sized" in this new movie, which combines animated characters from the hit SpongeBob SquarePants TV series with live-action elements. The story follows SpongeBob as he goes on a quest to discover a stolen recipe that takes him to our dimension, our world, where he tangles with a pirate. Antonio Banderas stars as the pirate in question, dubbed Burger-Beard, who holds the key to the stolen recipe that Spongebob and his friends are trying to find. SpongeBob SquarePants voice cast members Clancy Brown (Mr. Krabs), Rodger Bumpass (Squidward Tentacles), Mr. Lawrence (Plankton) and Carolyn Lawrence (Sandy Cheeks) reprise their roles in this live-action/CGI hybrid. Paul Tibbitt, who directed 2004's The SpongeBob SquarePants Movie, returns to the helm for The Spongebob Movie: Sponge Out of Water, which hits theaters nationwide on February 6. Take a look at the latest footage before heading to theaters this weekend, to see how Spongebob adapts to the real world, far away from his home in a pineapple under the sea.